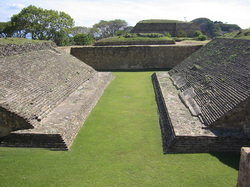 One of the oldest team sports ever developed had originated in Mesoamerica, and although archaeologists are uncertain if it had been invented by the Olmecs, it played a large part in Olmec culture as they spread it to surrounding areas. This sport, which was called called tlachtli by the Aztec, pok-a-tok by the Mayas, and ulama by some other Mexican groups, included both important religious ceremonies and social aspects. The game usually gathered hundreds of people to watch as two teams try to get a solid rubber ball through hoops emerging from the sides of two walls. The players were not allowed to use their hands or feet and if you lost the game, the captain of the losing team was killed as a sacrifice to the gods and a way to feed the earth and sun to prevent from crop failure or disaster. Stakes were high even for spectators. People would often make bets on the winning and losing team, sometimes offering themselves or kin as slaves if they lost the bet. The crowd, in certain areas, had to give all their belongings to the winning team, who was regarded with great honor, encouraging bands of people to leave before the winning play was made. It came to be that the game was seen as forces of good and evil battling on the field, making human sacrifice more crucial to their society. Evidence suggests that infants were sacrificed to gods who controlled the rain as a symbol of rebirth.